Olive oil is something that I cook with on a daily basis. Yesterday I discovered that I don’t know nearly as much as I thought about this wonderful ingredient. Did you know that extra virgin olive oil is not the best type of olive oil to cook with? I thought I would share some of my findings with you. Today olive oil is primarily produced in Spain, Italy, and Greece. Together these three countries produce more than 70 percent of the world’s olive oil supply. The flavor of the olive oil can vary dramatically depending on the source, the variety of olive, the soil conditions, weather, etc., just like wine. Olive oil is produced by grinding olives and extracting the oil by mechanical or chemical means. Olive oil for consumption is broken down in to four categories, extra virgin olive oil (EVOO), virgin olive oil, pure olive oil, and lite olive oil. You should have at least one bottle of each in your kitchen as they are all intended to be used very differently. EVOO is the most flavorful and considered the finest. The word “virgin” indicates that the olives have been pressed to extract the oil; no heat or chemicals have been used during the extraction process. The flavor of EVOO is best when uncompromised by heat. It is intended to be used in salad dressings, marinades, or to finish off a dish. For example, drizzle it over your caprese salad, bruscetta, or pasta. Note: Look for bottles that say “cold press” on the label. If it’s not cold-pressed, the heat from the extraction process changes the chemistry and quality of the olive oil. Virgin olive oil is perfect for garnishing and is great hot or cold. It’s essentially a low grade EVOO with a more mild flavor. Pure olive oil is intended for your every day cooking. It has a mild flavor and is perfect for anything cooked over heat. It is actually a blended oil product of refined pomace oil and virgin olive oil. Pomace is produced by processing the leftovers of the virgin olive oil. Lite olive oil is the least flavorful of the olive oils. It is not lower in fat as one might assume. It can withstand heat up to 470º and has a high smoke point. This makes it ideal for frying and baking as it can withstand high temperature cooking and the flavor is not compromised. Regardless of the type of olive oil you use, be sure to find one with a green tint to it, not yellow. Good quality olive oils should appear green in color. To delay spoilage of olive oil, be sure to store it in a cool dark place. 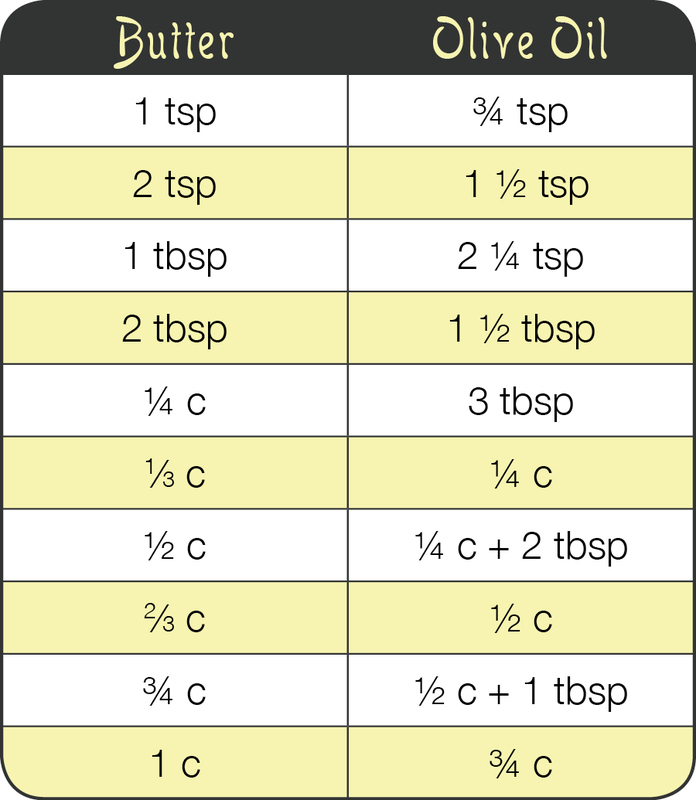 Use this chart to convert the quantity of butter called for in a recipe to the required quantity of olive oil for easy substitutions. Olive oil is Amazing! Thanks for the tips!